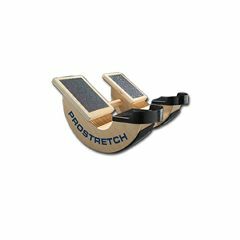 This version of the patented ProStretch conditioning and stretching device is made of hand crafted wood and is 25% larger that original plastic model. Bi-lateral version allows you to exercise both legs simultaneously. Exercise both legs simultaneously to improve flexibility and alleviate injuries to the lower extremities. Instruction manual and stretching DVD included. Shoe size 14 - 21.